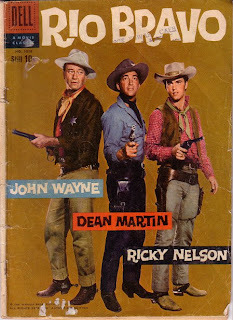 In 1959, right around my birthday, a movie was released called Rio Bravo. John Wayne was at that time one of those generational hangovers between the thirties generation and the boomers. Baby-faced Ricky Nelson (Ozzie and Harriet), who played a stone-cold killer, sang a few songs as a sop to the kiddies and the bubble-gummers who might be bored by all the craggy faces of the “Greatest” generation. I attended with an older brother and his cynical thirteen year old friends, one of whom threw a wad of gum at Ricky Nelson, onscreen, to a chorus of appreciative teenage boos. As sweet and treacley as Ricky Martin’s personality was he did master the double gun twirl which he pulled off with much aplomb. Elvis had sacrificed his sideburns and ducktail for a respectable army crew-cut the previous year in 1958 and radio (except for a few talented bands like Dion and the Belmonts), was a bland wasteland of pimply teenage idols who sold millions to adoring tweeny fans. Walter Brennan, star of TV’s Real McCoys, and a best selling recording artist on “Old Rivers,” played Stumpy, John Wayne’s cantankerous sidekick, bringing some much needed comic relief to an otherwise bleak film of alcoholism and violence. Like John Wayne, Republican Walter Brennan would become persona non grata to the hippie left of the oncoming sixties. Dean Martin as well, the drunken bugger insulted rock royalty when he ridiculed the Rolling Stones on his show in 1964. 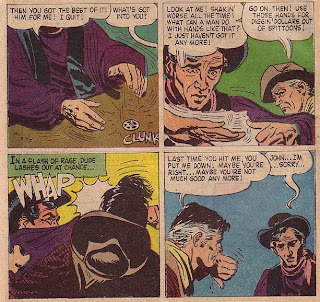 As sidekicks go, though, Brennan was one of the best of a group of comic men that included Gabby Hayes, Chill Wills, Andy Devine and Slim Pickens. When Slim Pickens was gutshot in Pat Garrett and Billy the Kid, and staggered off to a Bob Dylan dirge, Knockin’ on Heaven’s Door, was that Peckinpah’s tribute to the passing of the “American Sidekick?” At any rate Brennan’s voice was unforgettable; he was one of the funniest sidekicks in the movie business. John Wayne teased Stumpy unmercifully, and he limped through the movie in a permanent state of grumpy, bruised, hurt feelings. 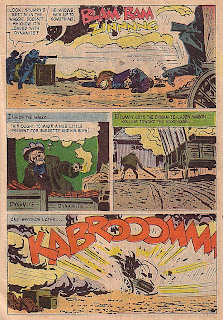 Dell Comics (“are good comics”) released a comic book adaptation of the movie, illustrated by the prolific Alex Toth, as they did every Hollywood film and television show in that period, from Santiago to Quentin Durward. The artists worked from movie stills provided by the studios and yet I noticed they never seemed to capture likenesses that well. 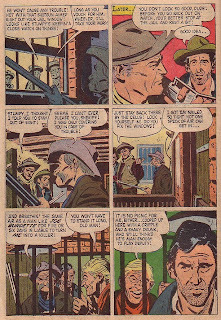 Dell, in keeping to their “Pledge to Parents,” that their comic magazines contained only “clean and wholesome entertainment,” left the blood out of the following scene. In the film it was the dripping blood that alerts the town drunk, played by Martin, that a cowpoke in the rafters has a bead on him. The blood was crucial to the film but left out of the adaptation. The adaptation was actually quite well scripted, in 32 pages little of the plot of the film was left out. None of the actors, however, was portrayed in a very recognizable way. The worst were Walter Brennan, who bears no resemblance to the grizzled sidekick, and Angie Dickinson, likewise. Could be they had to make do without a movie still of that actress. 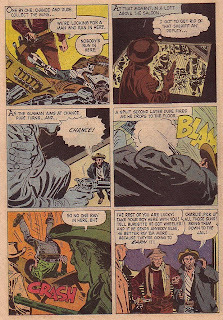 Toth may have been a dud as a caricaturist of celebrities but his impressionistic artwork was up to his usual standards. 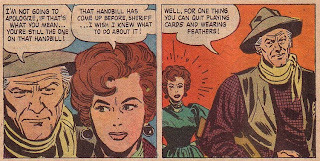 On the basis of other work by Toth I'd agree that he wasn't the best at capturing likenesses. However this may not be what was at work here. During my college days I corresponded with Toth about his Dell work and Dell media comics in general. 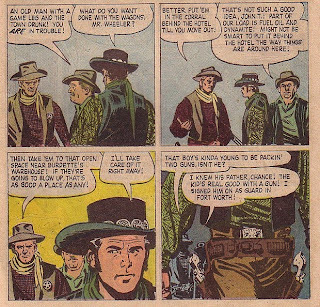 I'd noted how the stars in some comics looked vaguely like the actors while in others there was no resemblance. Toth told me that whether a likeness was used was often contractual. For example in "Wings of Eagles" John Wayne had specifically asked that his likeness NOT be used. Frank Thorne wrote me that when he began drawing "20,000 Leagues Under the Sea," Disney still hadn't finalized the cast--although all the prop and set designs were finished. They supplied Thorne a stack of stills; the result was that the sub was dead on while the characters were entirely "wrong"--Thorne had simply made them up. Finally, George Evans said that though some studios supplied comic artists with lots of reference, others just sent a still or two. In those days before VCR's there was no way to gather further reference, and the artist did the best he could.